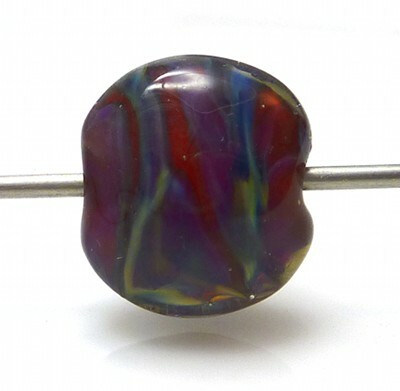 This week I was trying to use red, green and blue in the same bead. It’s tricky. Fritties: Sangre lentil encased in clear with chameleon frit. 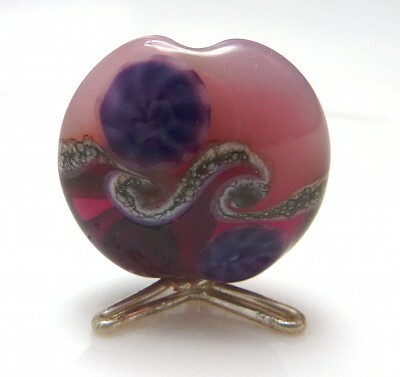 BeadySam’s Gem Surprise frit over white, then over a sangre core that was encased in clear, then over dark lavender, then over periwinkle. Dragons Candy frit over sangre (way too dark!). 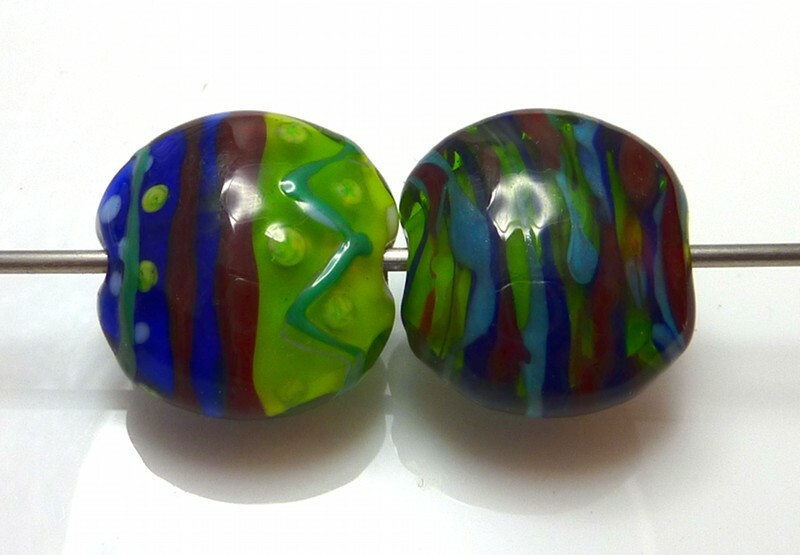 Dark blue transparent over white with Gem Surprise.White core encased in teal, with robin’s egg blue frit. Another sangre core encased in clear with Gem Surprise. 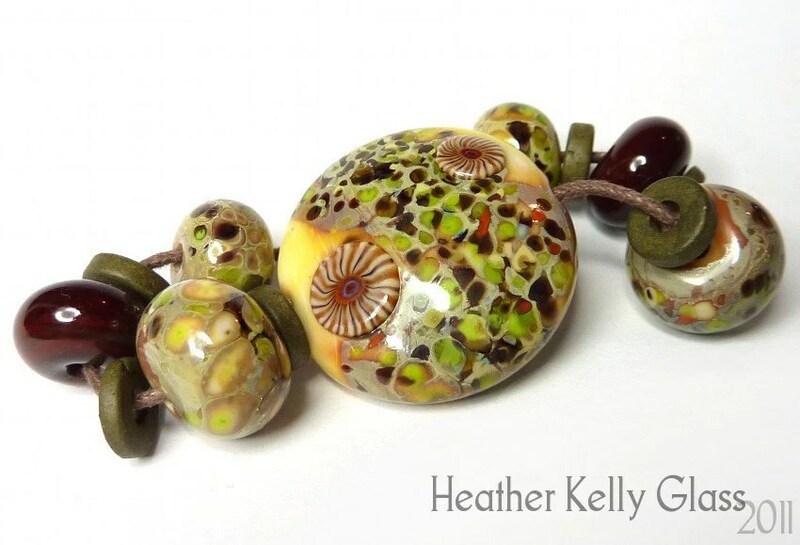 Jungle beads. I’m calling them that because the lentil looks like someone twisted a jungle! The bases are sangre, periwinkle and pea green, and I used some short ends of twisties from Jolene to decorate each bead. The lentil was half periwinkle, half pea green with all the leftover little twistie ends from the other beads, and the centre was swirled. Another pair of tries with red, green and blue. The left lentil is a white core, half encased in dark grass green, half in cobalt blue, zig-zag and dot decoration on top. 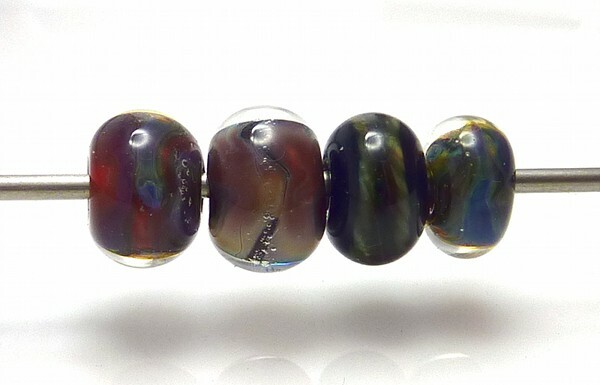 The second is a pea green base with black hair thin stringer lines, encased in teal, then med lapis, dark turquoise and dark blue transparent trails, and sangre on top. 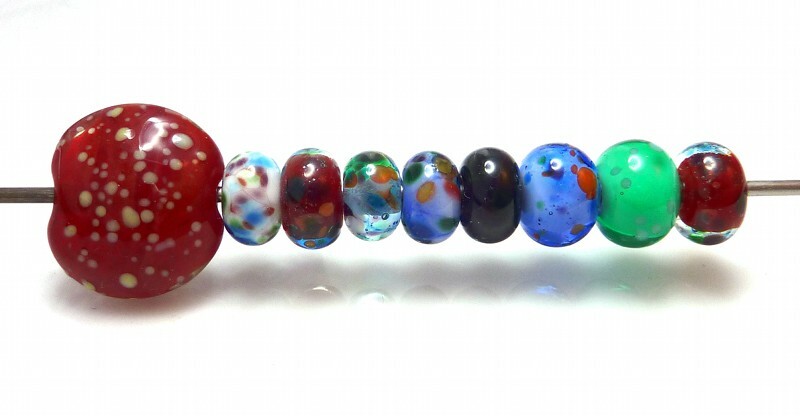 I decided after these that to use red, green and blue successfully together in one bead, I probably needed a fair amount of white in it as well. Haven’t tried that yet, though! I had another go with Reichenbach silver brown. Here there is a silver brown core, reduced and encased in clear, and a sangre core encased in silver brown, reduced and encased in clear. The second one in particular I got too hot while trying to melt the clear round. Pale green apple faux boro stringer over sangre, encased in clear. Hades and multicolour dark twistie over sangre. Sangre with very thin rings of MCD, encased in clear. Repeat of the first one but with more faux boro stringer. And a matching lentil – sangre with pale green apple faux boro stringer, encased. In the How Not To Do It files, silver brown over sangre lentil, reduced and then begun to be encased… It was taking ages, I already suspected I’d got the core too hot, and then the fire alarm in the hall started beeping because its battery was running down. So I put the bead away as was and went and fixed the alarm. Here we have a kryptonite lentil rolled in purpur, chameleon, robin’s egg blue and granny apple green frit and the centre swirled. The middle two rounds are dirty martini with those same frits and then with a red frit blend. Finally, a rose opalino lentil with purple twisties. This is rose opalino and Reichenbach pink lady with SIS round the centre and swirled, plus Jolene’s purple murrini. Teal lentil with quartz grey shards. I was going to do more with this, but broke my bead release. 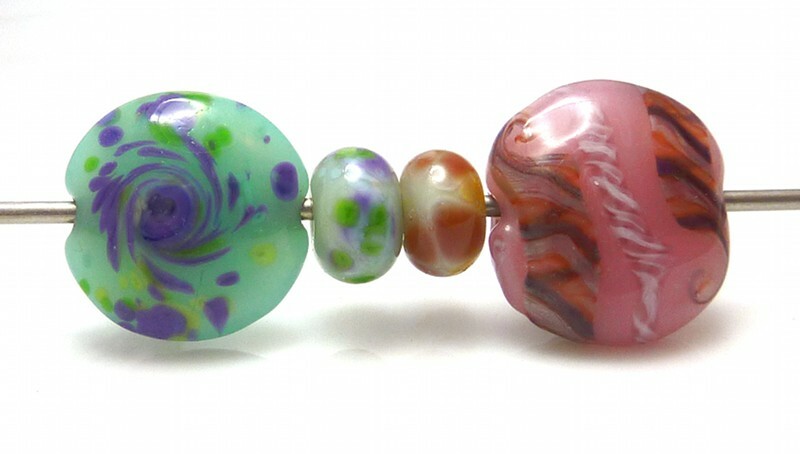 Then two somewhat messy kaleidoscope beads from Passing the Flame. 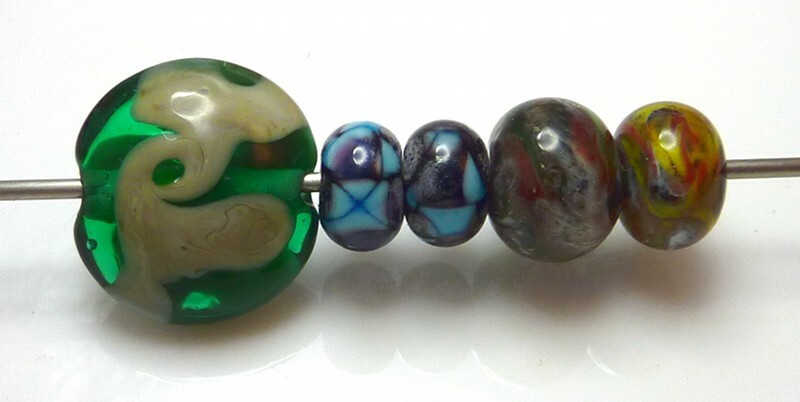 Then two tiger-ish beads. 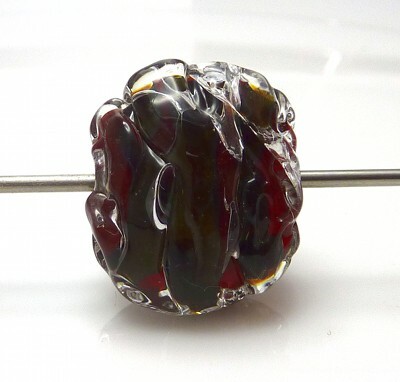 The first is a black base with a green and red twistie, SIS, some uranium yellow transparent and encased in clear. 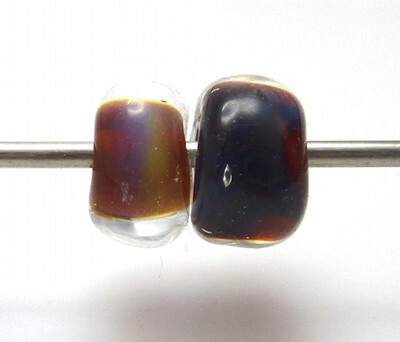 The second is a black base, SIS, yellow and red twistie and some amber on the surface.